A suave running game that is both shaken and stirred. 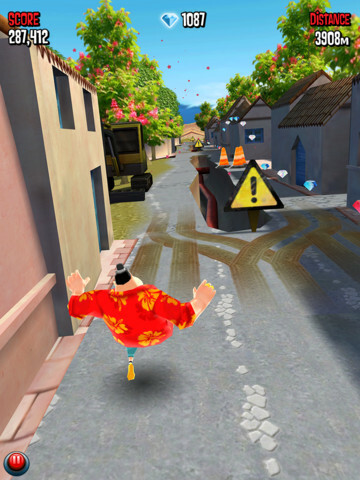 Laser beams, falling rocks and treacherous pits, three hazards you'll face in Full Fat Productions' Agent Dash, a Temple Run style running game for iOS and Android that excels because of its impressive visuals, super spy theme and a little imagination for good measure. If you enjoy cheap thrills (it's free-to-play), slip into that virtual tux, grab your silenced pistol and jump behind enemy lines. If you've played these types of games before, Agent Dash will feel somewhat familiar. Despite its secret agent theme, you don't fight thugs or prevent nuclear annihilation. The two primary goals, as with all runners, involve seeing how fast you can travel while picking up virtual currency (in this case, gems) along the way. 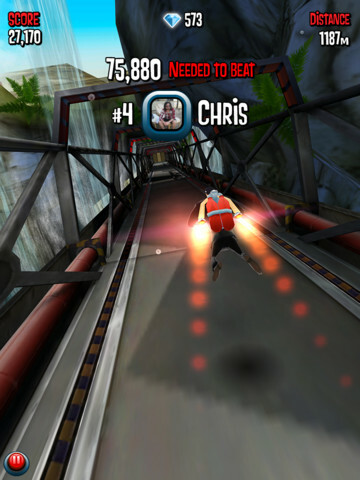 To that end, the game requires split-second timing, as the developers send the character(s) through a never-ending obstacle course where the difference between life and death is but a jump or slide away. That said, Full Fat divided the play area into three zones: left, medium and right. You swipe in these respective directions to position the agent, flick up to jump and down the slide. Prepare for extensive finger gymnastics, since the game does an excellent job throwing increasingly difficult objects across your path, be it broken tree (slide), those aforementioned lasers (jump) and even trucks (slide again). You'll navigate across a crumbling bridge, vault over cones in some town and even blow things up with the agent's gun by tapping the screen. Fun, to say the least. Meanwhile, there's a decent number of items to help give you a boost, from a jetpack that propels the agent forward two seconds to a magnet that gathers all the gems in sight. That last one is particularly important, as you'll use those precious stones to upgrade power-ups, unlock additional agents and even buy new weapons. 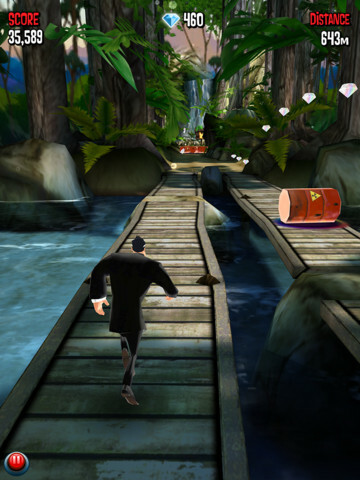 What really sets Agent Dash apart from all those Temple Run clones, though, are its graphics. This is by far the prettiest running game we've seen on the App Store, devoid of all the jagged edges and overall sloppiness that plagues its rivals. Go ahead and play another title before firing this one up, and the difference will be so apparent that you'll demand this high level of quality moving forward. So what's wrong with it? We'd love to see a greater change in scenery, as the environments repeat. On top of that, the whole super spy theme feels like more of a gimmick than integral piece to the gameplay. There's a lot of room here for Full Fat to do something special, perhaps fleshing out the James Bond concept with more gadgets and a better use for the weapons, which feel woefully underutilized. Beyond that, Agent Dash is a somewhat refreshing take on a popular and perhaps overexposed mobile sub-genre. It's a clear must have if you dig these types of games, and we hope future imitators (of which, there appear to be hundreds) use this effort as inspiration to innovate, instead of simply ripping it off. Until that happens, make with some Dash. What's Hot: Graphics that put Temple Run to shame, nine agents to unlock, cool variety of power-ups and gadgets, free-to-play. What's Not: Poorly utilized shooting segments, doesn't take full advantage of super spy theme.